who help make all this happen! Decorative Glass Solutions starts every project with a free estimate and several photos of their glass designs sent by email. If we are within your budget then Diane Fairburn, design director, will meet you in your home, our studio or by conference call and bring her 35 years of experience to bear on your project. Our designers are happy to design and create your next custom decorative glass solution. During the design consultation Diane will take your ideas and hers and sketch a creation that will blend the privacy and beauty you desire in your glass. Once a contract is signed you will receive, via fed ex, a full scale drawing that can be hung in place along with glass samples. Diane will discuss with you any changes that need to be made for your final approval. 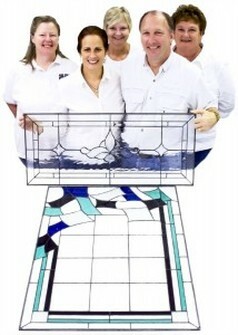 We have a team of highly skilled Stained Glass Craftspeople that produces your final window! The final paper drawing is cut into the various shapes that will become the new window or door panel. The shapes are transferred to each type of glass that was chosen then cut from sheets of glass. The shapes are reassembled (like a jigsaw puzzle) on a table to be wrapped in copper foil tape. Once wrapped, the pieces are ready to be soldered with lead on both sides to hold them in place. The perimeter of the of the design is framed in lead caming. The many pieces are now one and are taken to be cleaned and dark patina is applied. This takes the lead from a bright chrome finish to a dark pewter finish by advancing the oxidation process and sealing the lead. The piece is painstakingly cleaned and polished again to remove, grease, dirt, fingerprints from both sides before being packed for delivery or install.